Conference and Exhibition Season is upon us. After having recently participated in conferences throughout the Middle East and The Netherlands, the show goes on. In the coming weeks there will be major conferences and exhibitions in Florida, Queensland and Germany. 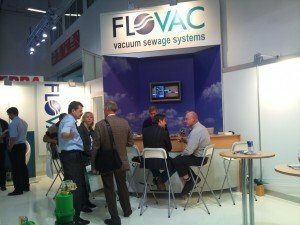 All all of these Flovac will have an exhibition stand with a number of the Flovac global team members on standby ready to answer any of your vacuum sewer questions and to show you the latest in Flovac technology and details of our latest projects. Not only will the team of operators and engineers be able to talk about pump station upgrades, asset management and how best to extend your existing vacuum system there will also be a focus on the latest in Flovac’s Monitoring Systems. Our technical team will be able to talk to you about our wired and wireless systems and talk about how you can reduce your operational costs and risks. The newest monitoring technologies has led many engineers to realize that vacuum systems can outperform traditional gravity sewer systems even in area’s that might not traditionally have been thought of for vacuum. When you can start pinpointing where and when infiltration is occurring or exactly when and where a problem in a network has occurred then you are creating a smart solution. You can also start to see that with integration into your city wide “SMART CITY” communication network you can integrate water and wastewater networks seamlessly.